Lucky Star’s president, Edward Leung, promises that passenger safety will be a top priority if the line gets back on the road. Two Boston bus carriers that were shut down by federal authorities earlier this year are trying to get back on the road. Lucky Star has spent almost $1 million upgrading its operations, its owners said, and has leased five new buses and fired four drivers who failed an English-language test. Fung Wah has sold off 10 of its oldest buses and hired a full-time safety manager, according to an attorney for the company. Both carriers have hired safety consultants to oversee the reapplication process. The companies have met all the requirements to bring their vehicles, employees, and safety management practices up to federal standards and are just waiting for the government to allow them to start carrying passengers. If approved, they could again be running buses between South Station and New York’s Chinatown later this fall, although the number of trips would be limited for the first two months. The Federal Motor Carrier Safety Administration, the Department of Transportation agency that regulates interstate bus travel, said it will evaluate the Boston companies’ applications to resume operations. The agency, which is conducting a nationwide crackdown on high-risk companies, has shut down 35 carriers since the beginning of the year. Fung Wah’s operating authority was revoked in March after inspectors found cracks in the frames of many of its buses and the company refused to turn over its safety records. A compliance review by federal officials turned up other violations, including falsifying maintenance records and operating buses that had been ordered out of service. Lucky Star lost its license in June for not properly maintaining its buses and failing to monitor drivers’ hours and drug and alcohol tests. The carrier’s buses broke down more than 80 times in its last year of operation, and inspections turned up violations for bad brakes and rotted floors. In their first in-depth interview since the shutdown, Lucky Star president Edward Leung and his wife, Maria Wong, the chief operating officer, detailed improvements they have put in place over the past few months. Half of the 19-bus fleet is new, including several buses that were purchased right before the company was ordered to stop. Each bus is equipped with a digital system that allows drivers to immediately transmit their vehicle examination reports. 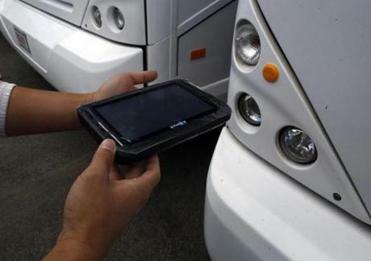 They have also installed devices that limit the speed of each bus to 65 miles per hour. Each driver has undergone training in federal regulations, vehicle inspections, and other safety measures, and managers have been instructed in proper record keeping. Leung and Wong own Lucky Star with Leung’s brother, Albert, who founded the company and has since returned to China. The couple also owns four restaurants in the area: East Ocean City and Kaze Shabu Shabu in Chinatown, Fugakyu in Brookline, and Fugakyu Café in Sudbury. 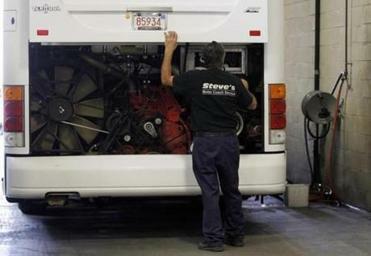 Head Mechanic Steve Desmaris checked a bus at Lucky Star headquarters in Boston. Lucky Star challenged some of the citations issued by the federal agency when it pulled the carrier off the road. The bus cited for having a 2-by-4-foot hole in the floor was pulled out of service the day the damage occurred, caused when a manhole cover hit the bus, said Paul Sullivan, a former Massachusetts State Police captain who is working as a safety consultant for the company. One of the drivers cited for not having the proper credentials was a mechanic who was delivering an empty bus to Rhode Island for engine work, he said. Fung Wah has put all of its drivers, dispatchers, and mechanics through safety training and had adopted a new maintenance plan, “more stringent in certain circumstances than is required by federal regulations,” said Bill Phelan, a former Quincy mayor who is representing Fung Wah. 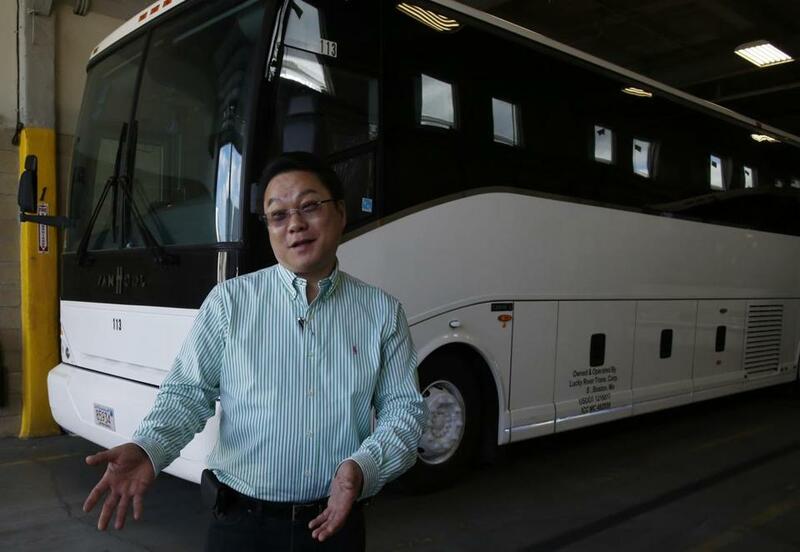 “Fung Wah stands ready, willing, and able to start driving their buses again,” he said. Fung Wah is also being represented by Jeffrey Mullan, the former state transportation secretary. Digital technology will help Lucky Star keep inspections in compliance with regulations, the company says. If reinstated, both carriers would be required to submit quarterly reports to the Federal Motor Carrier Safety Administration for four years, according to documents obtained by the Globe through a public records request. The reports would detail the status of the fleets, managers, vehicle inspectors, and drivers, including speeding violations, drug tests, and English-language proficiency. Reports about accidents, training, and inspections must be submitted annually. Lucky Star ticket prices may go up when the carrier starts service again to help cover operating costs, Leung said. The carrier had raised prices to $20 during the week and $25 on weekends after Fung Wah stopped running, and may raise them to $25 and $30, respectively, if it gets approval to resume operations. Leung and Wong know customers may be worried about taking Lucky Star after the shutdown, but they stressed that passenger safety is their main concern. “I really believe after this, we will be a much stronger company,” Wong said.